In this article we will look under the hood of the software. 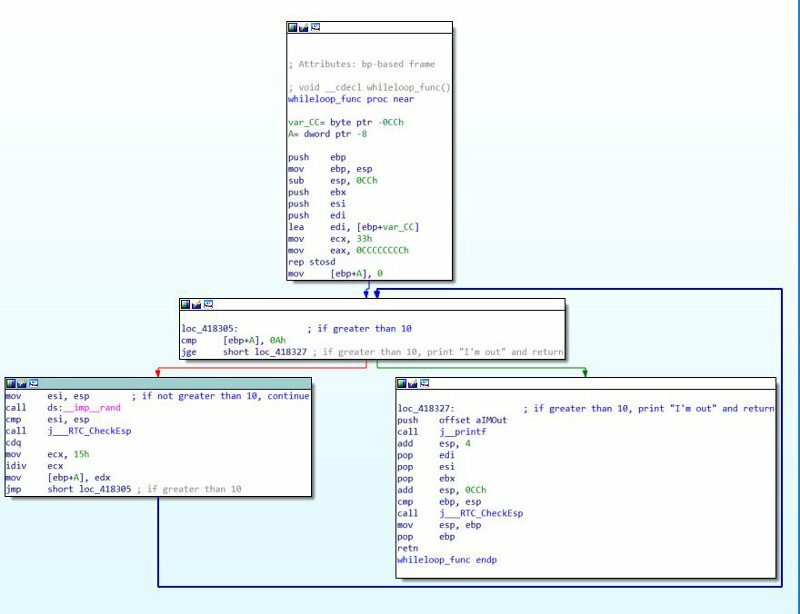 Newbies in reverse engineering will get a general idea of ​​the software research process itself, the general principles of building code, and how to read assembly code. Note The program code for this article is compiled using Microsoft Visual Studio 2015, so some features in newer versions may be used differently. 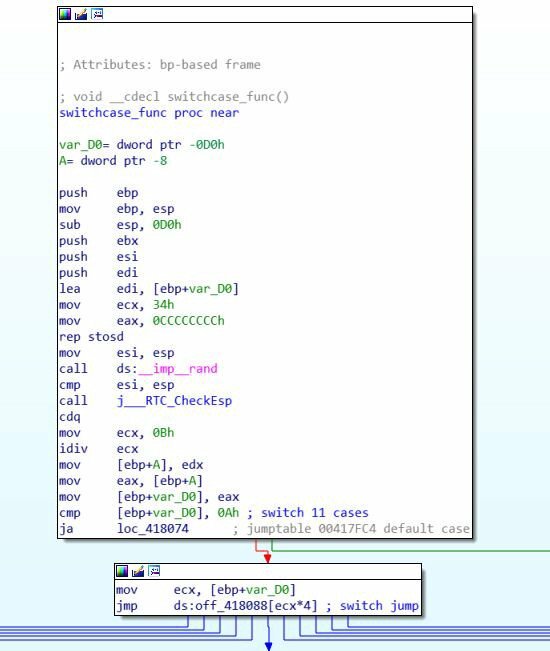 IDA Pro is used as a disassembler. in C ++, a string is not a primitive variable, but it is important to understand how it will look in native code. 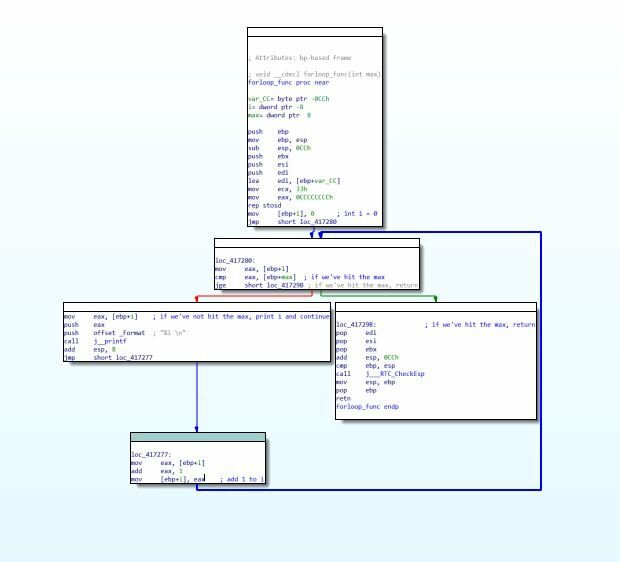 Here you can see how IDA shows the allocation of space for variables. First, space is allocated for each variable, and then it is initialized. Once the space is allocated, the value we want to assign to the variable is placed in it. The initialization of most variables is shown in the picture above, but how the string is initialized is shown below. To initialize the string, you need to call the built-in function. Note Here we will talk about how variables are pushed onto the stack and then used as parameters for the output function. The concept of the function with parameters will be discussed later. For data output, it was decided to use printf(), not cout. As you can see, the string literal is first pushed onto the stack for calling the function as a parameter printf(). 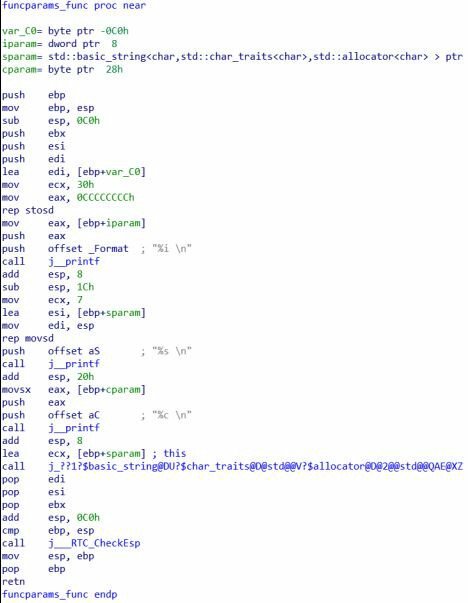 As you can see, the variable intvaris first placed in the EAX register, which in turn is written to the stack along with the string literal %iused to denote integer output. These variables are then taken from the stack and used as parameters when calling the function printf(). Bit shift to the right. Bit shift to the left. we first assign the Avalue 0Ato a variable in hexadecimal or 10 in decimal. The variable Bis 0Fequal to 15 in decimal. For division the instruction is used idiv. We also use an operator cdqto double the size of EAX and the result of the division fits in the register. A function that does not return a value (void). A function that returns an integer. First, let’s see how the functions are called newfunc()and newfuncret()which are called without parameters. 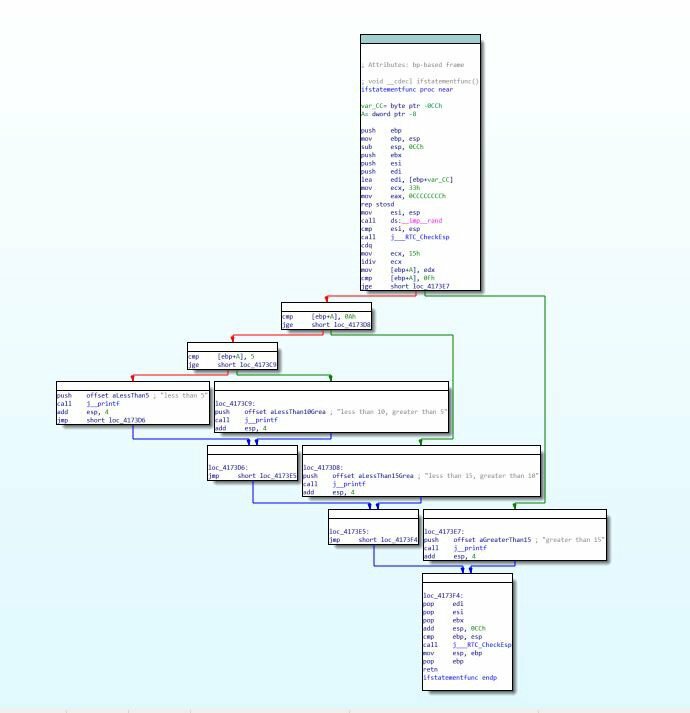 This function uses the instruction retn, but only to return to the previous location (so that the program can continue its work after the end of the function). Let’s look at a function newfuncret()that generates a random integer using the C ++ function rand()and then returns it. First, space is allocated for the variable A. 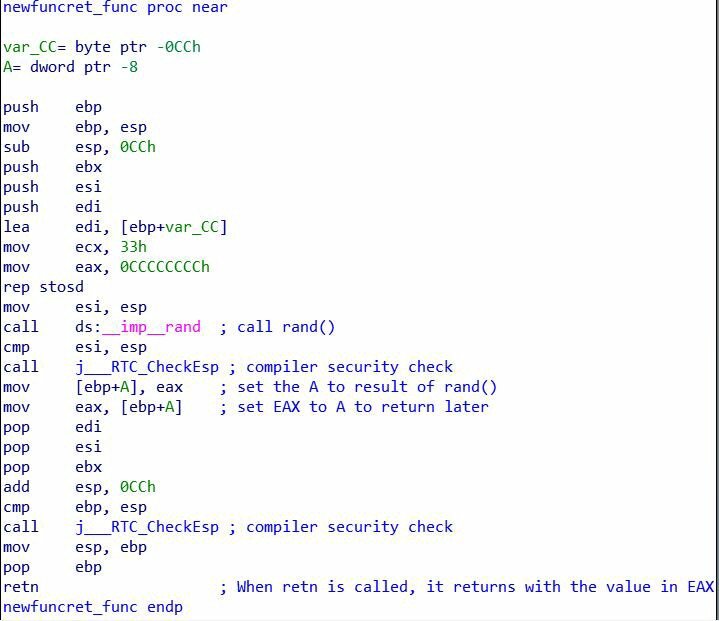 Then the function is called rand(), the result of which is placed in the EAX register. The value of EAX is then placed in the place allocated to the variable A, effectively assigning the Aresult of the function to the variable rand(). Finally, variable A is placed in the EAX register so that the function can use it as a return parameter. Now that we have figured out how to call functions without parameters and what happens when returning a value from a function, let’s talk about calling the function with parameters. Strings in C ++ require calling a function basic_string, but the concept of calling a function with parameters does not depend on the data type. First, the variable is placed in the register, then from there to the stack, and then the function is called. This function takes a string, an integer and a character, and prints them with a function printf(). 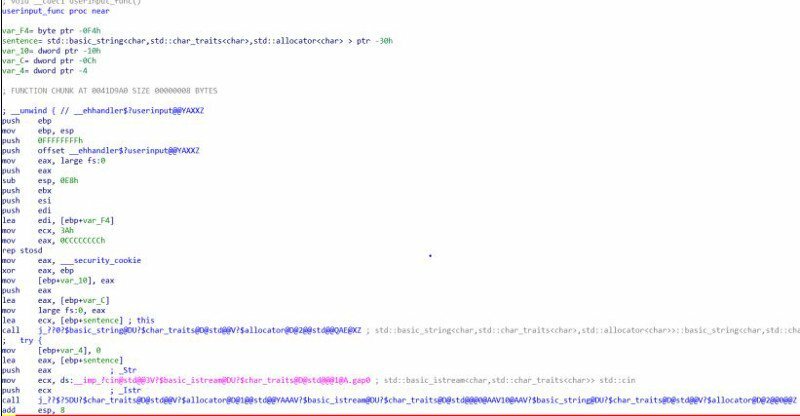 As you can see, first the variables are placed at the beginning of the function, then they are pushed onto the stack for calling the function as parameters printf(). Very simple. it can go to the block on the left (red arrow) and go back to the beginning of the for loop. Variables are compared first iand maxto check if the variable has reached its maximum value. If the variable is inot greater than or not equal to the variable max, then the subroutine will go along the red arrow (down to the left) and output the variable i, then iincrease by 1 and return to the beginning of the cycle. If the variable is igreater than or equal max, the subroutine will go along the green arrow, that is, it will exit the cycle forand return to the main program. In this cycle, a random number is generated from 0 to 20. If the number is greater than 10, then the loop will exit with the words “I’m out!”, Otherwise the work in the loop will continue. In machine code, the variable is Аfirst initialized and equated to zero, and then the cycle is initialized and Acompared to a hexadecimal number 0A, which is 10 in the decimal number system. If Аnot greater than and not equal to 10, then a new random number is generated, which is written in А, and the comparison again occurs. If Аgreater than or equal to 10, then exit from the cycle and return to the main program. This function generates a random number from 0 to 20 and stores the resulting value in a variable А. If A is greater than 15, then the program will display “greater than 15”. If A is less than 15, but more than 10 – “less than 15, greater than 10”. If less than 5 – “less than 5”. The graph is structured similarly to the actual code, because the conditional operator looks simple: “If X, then Y, otherwise Z”. If you look at the first pair of arrows above, then the operator is preceded by a comparison Аwith 0F, which is 15 in the decimal number system. If it is Аgreater than or equal to 15, then the subroutine will output “greater than 15” and will return to the main program. In another case, a comparison Аwith 0A(1010) will occur . This will continue until the program displays something on the screen and returns. In this function, the variable Аgets a random value from 0 to 10. 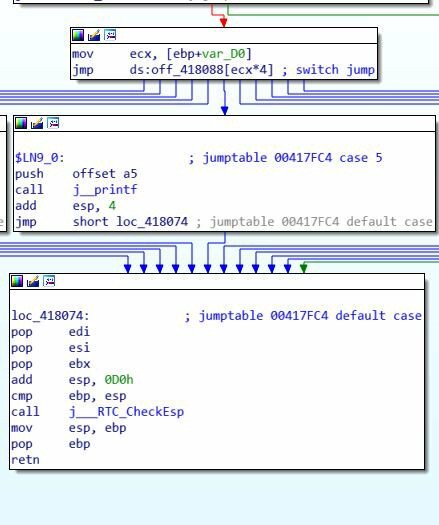 It is then Аcompared with several cases using switch. 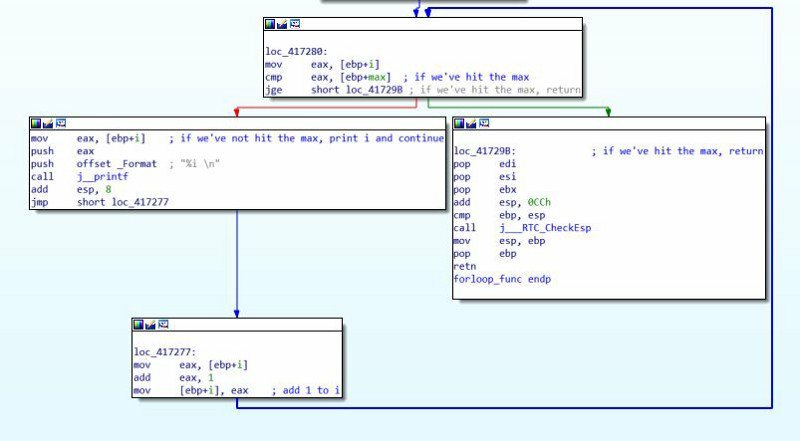 If the value Аis one of the cases, the corresponding number will appear on the screen, and then the operator will exit the selection operator and return to the main program. The choice operator does not follow the rule “If X, then Y, otherwise Z”, unlike the conditional operator. Instead, the program compares the input value with existing cases and performs only the case that matches the input value. Consider the first two blocks in more detail. First, a random number is generated and written to А. 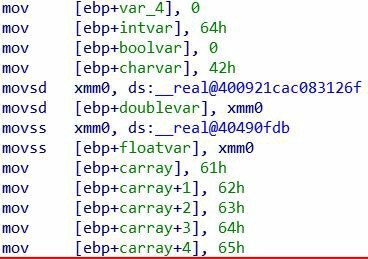 Now the program initializes the select statement, equating the temporary variable var_D0with А, then checks that it is equal to at least one of the cases. If var_D0a default value is required, the program will follow the green arrow to the final return section from the subroutine. Otherwise, the program will make the transition to the desired one case. If it var_D0 (A)is equal to 5, then the code will go to the section shown above, output “5” and then go to the return section. 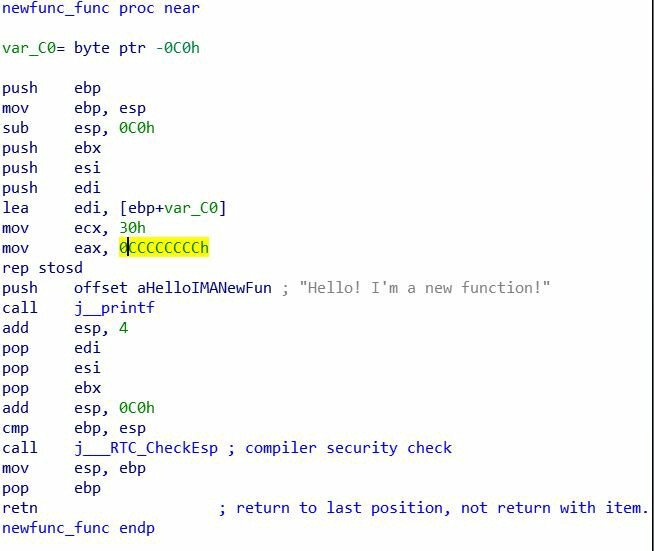 In this function, we simply write the string to the variable of the sentence using the C ++ cin function and then output the sentence using the operator printf(). First, the string variable is initialized sentence, then the call cinand the entry of the entered data into sentence. We considered only the basic principles of the software at a low level. Without these fundamentals, it is impossible to understand the work of software and, accordingly, to engage in its research.